The continuous ink supply system on the Epson R380 printer developed a slow air leak in one cartridge, which may have contributed to the nozzle problems, so I just installed another system from the usual eBay supplier: prefilled with ink and $30 delivered. 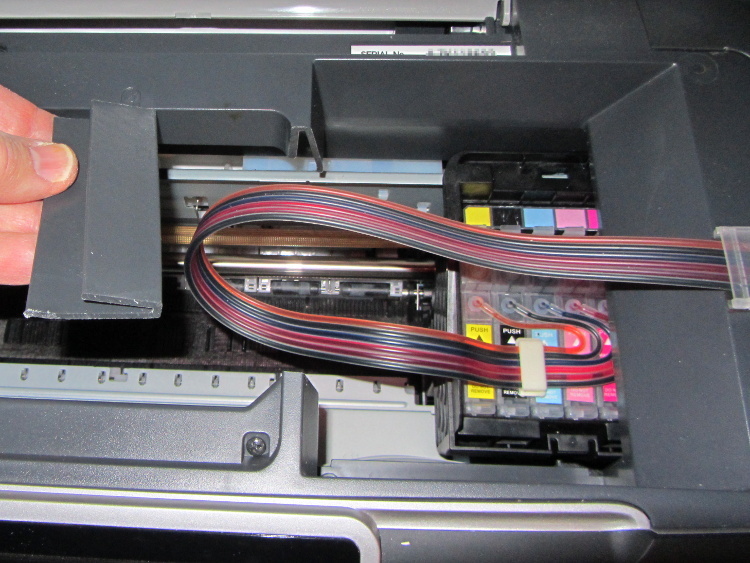 As nearly as I can tell, Epson designed a number of features into the R380 specifically to thwart CISS installation, including the awkward bridge across the middle of the printer that interferes with the flat tube feeding ink to the flying cartridges. I managed to route the previous CISS tubing around the bridge, but this time I figured enough was enough. This entry was posted on 2013-02-19, 07:54 and is filed under Home Ec, Machine Shop, PC Tweakage. You can follow any responses to this entry through RSS 2.0. Both comments and pings are currently closed. I’ve been thinking of getting one of these systems for my Epson R220; the (quite low) cost of the system plus a full set of appropriate 100 mL bottles of ink is still less than actually buying a full set of Epson ink in what… 10 mL quantities? But I have some lingering doubts about whether it is worth the trouble compared to injecting the ink into an old or purpose-bought cartridge, coupled with a chip resetter. I think that’s the way to go for printers with separate printheads, simply because the flying hose is such nonsense; I cycle four sets of refillable tanks through the Canon S630. The tanks on the R380 contain such a minuscule dash of ink that I put up with the hose, but it’s really marginal. I just cannot understand why anyone even considers buying inkjet printers. A laser printer with a lifetime supply of toner can be had for less than the price of all this messing around, and it will Just Work, forever, with never a clogged head or any other nonsense. And faster and quieter and with better output for text! Eventually the inkjet printheads will fail and then they’re history: they’re definitely non-repairable. At that point, I’ll probably go the color laser route, as a friend has been running one with good results. I think the economics of color laser vs. bulk inkjet is about equal, but I haven’t run the numbers; both are certainly less awful than OEM inkjet cartridges! The monochrome HPLJ1200 just runs forever on a cartridge, but it doesn’t handle many images. Color laser images seem too contrasty, but maybe that’s because I haven’t seen any well-configured images. We do print a fair number of pictures, so maybe I need a token inkjet just for those… drat! Lots of great services that’ll do photos far better than even the best inkjets, let alone the consumer ones, for a few pennies apiece, including Costco and any number of mail-order labs. But maybe that’s just me — I print several thousand pages a year of text and maybe a dozen or two dozen photos. We had horrible experiences with several local services (well, local outlets with outsourced processing), including manually applied red-eye removal with what must have been a precisely modeled mashed-point marker on an image that didn’t have any red eye to begin with. Maybe they all had bad days when our images came through, but we sort of gave up on that concept. Actually there are several (Dutch) tests that showed there were alternative inks that performed from equal to better to the original ink, although if I recall correctly the better applied primarily to HP. Of course if you just pick up any old ink chances are it’ll be worse. For one thing there’s health concerns. But for the record, our laser printer developed an annoying stripe after only a few hundred prints at most. That was fixed, but then it died a couple years later for good. In the end I think it was in service for about three to four years, which I find disappointingly short, and it’s more or less on par with my worst inkjet experience. I don’t quite recall what happened to its twin sister; I think that one actually did much better. My current inkjet has been in service for a decade and it’s still going strong. The only problem is that ink is rather expensive, but through using lower DPI settings a lot unless it’s meant for someone else you can keep things in check quite well. Also I have to disagree about those el cheapo digital photo prints. I don’t particularly like printing photos myself or anything (text + pictures on the other hand is very nice), but a test with some of those services a few years ago was rather disappointing. Paper so thin you could practically see through it and the quality was awful. Some even applied some very unwelcome color-level adjustments, but I suppose that particular flaw may not quite be their fault. In fact they’re even showing worse discoloration than output from my printer after a few years. Of course I don’t know how alternative ink supplies would work in that regard, but frankly it can hardly be any worse. One might wonder if something similar to my link above plays a role there. through using lower DPI settings a lot unless it’s meant for someone else you can keep things in check quite well. But of course I also use high DPI if the final version is for myself. ;) In any case, I much prefer proofreading on paper.